You’ll hear this idiom more than anything else at my house. But I heard something this week that has convicted me of many things; most notably the way we speak. But first let me assure you, I do feed my children … and they’re not starving. I’m sure if they think hard enough, they’ll remember that they ate today. Many times. Their bellies are full, their eyes are bright and they’re able to move … not crippled over in pain from not having food in days … or weeks. They aren’t drinking fetid water from a hole in the ground that’s teeming with insects. Or pulling dry leaves from a nearby tree to stay alive. I quite literally gasped when I heard this. My hand then covered my mouth … I felt sick … I couldn’t speak … tears filled my eyes. The dad that uttered these horrifying words lives in a South Sudanese village. His name is Martin, and he has such a grieved stare in his eyes that I could barely stand to look at. His children were hungry. And he’d lost them because of it. And when I think of these little ones … their tiny graves … and this father’s despair … I can’t help but feel completely distressed about it. And so I should. If you’ve read this far I now have to tell you the rest of this story—his village is full of hungry children. After wrestling with the guilt that I probably threw away enough food to have kept this man’s children alive, I realized something greater. That I owe him so much more than just my feelings. I have to tell his story … and honor his children. South Sudan is a mess right now. A young country that should still be bathing in the celebration of independence is instead caught in a web of raging violence … economic disaster … and dire food shortages. Poverty is tightening its grip and the poorest people can barely breathe. But there is always hope. As I respond to the wretched hunger and unfolding crisis in South Sudan, part of me yearns to share this father’s story with my own kids. Especially the next time they tell me they’re starving. With the support of our donors, lives were saved, protected, and transformed in some of the world’s poorest places in 2014. Hungry families were fed, people in crisis were given shelter, and entire communities received abundant clean water. Displaced before they could plant crops, many in South Sudan face imminent threats of famine and starvation. One of the biggest challenges of 2014 was reaching families displaced by civil war in South Sudan. The problems affecting the world’s newest nation are extremely complex. Many families are still homeless, living in tents or under trees with no shelters. Prices have skyrocketed because of the war, leaving poor families unable to buy food or essential commodities. There is also a looming threat of famine – because they were displaced during the rainy season, many were not able to plant crops. As a result, the annual hunger gap, which is fast approaching in April, is expected to be worse than usual. Achol was nine months pregnant when she fled with her children after fighting broke out in her village in South Sudan’s Unity State. “I ran when I heard gunfire and saw people running,” she said. 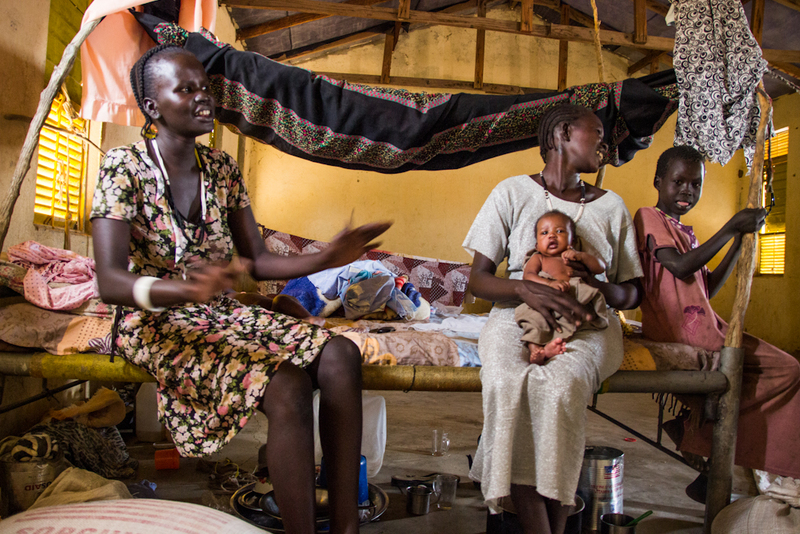 “I left with nothing.” Achol gave birth outside – alone – after arriving in a makeshift camp. “I had no food and no blankets. I delivered my baby and spent two days outside. Then I made this shelter,” she said, looking up at the flimsy tent made of sticks and tarps that sheltered her children. Families like Achol’s need help resettling and rebuilding their lives. It’s clear that the situation is South Sudan is complex. People like Achol face immense challenges and have great needs. But at World Concern, we refuse to shy away from complex problems because things are too hard. Rather, we tackle these challenges head-on, walking alongside the families in South Sudan into recovery and helping them rebuild their lives. Though these situations can seem hopeless and overwhelming, we put our full confidence in God – He alone can change lives and circumstances. He can bring peace to any situation, and nothing is too complex for Him. He has called us to be His hands and feet, and equips us with what we need to help the families in South Sudan and other challenging places. As we enter 2015, we rely on the ongoing support of our donors to help families and communities to move beyond crisis towards restoration, healing, and transformation. Flex! Young boys in South Sudan show their resilience in the midst of difficult circumstances. In December 2013, the world’s newest nation, only two years into a season without war, plunged back into crisis-mode. Though the explanation for this eruption of conflict is far from definitive, one thing is clear – South Sudan is still hurting. As we approach the one year anniversary of this newest conflict in South Sudan – a land that has suffered almost continuous war for over two decades – we (the world) need to remember that this war persists and tensions are only growing. And, as we so strongly believe at World Concern, we remind ourselves that war is about so much more than politics and land and resources. It is about the thousands, if not millions, of people whose lives are torn apart. According to the UNHCR, South Sudan now has more than 1.4 million internally displaced people who have been forced to flee their homes. Additionally, tens of thousands of people (at this point an exact number is difficult to track) have lost their lives. Though there has always been community tension and a scarcity of resources, we have never ceased to see the country for its potential to transform. When South Sudan gained independence in 2011, we celebrated with them. Unfortunately, the celebration was short-lived. South Sudan has faced immense challenges over the past three years. The recent conflict is bringing the nation to the brink of famine and starvation continues to be a very real risk. Since the country’s independence, World Concern has focused on empowering South Sudanese communities to move beyond a state of relief and toward long-term development. Eager to farm their own land, feed their own children, and be educated, people have been more than willing to take part in their community’s development. In fact, many of the communities we partner with now have their own gardens, banks, savings groups, job opportunities, and thriving markets. But many others were displaced from their homes and land when violence came dangerously close to their communities. As a result, hundreds of thousands were unable to plant crops before South Sudan’s annual rainy season. Because of this, many will go hungry this year. And too many are still homeless, living in squalid camps, waiting for peace. Mary (right) and her newborn son sit inside a vacated school they now call home. Last February I traveled to South Sudan to visit Internally Displaced Person (IDP) camps, sit with people, and listen to their stories. Among the many painful narratives shared, I will never forget Mary YarTur’s. Nine months pregnant when violence broke out in her village, Mary had no choice but to run. After days on the run, Mary and others settled outside of a closed school building. Two days later, she went into labor. Women sit outside of the school where Mary gave birth. In the three days I spent visiting camps, Mary was one of five women I met with newborn babies – a small representation of the thousands of children that have already been born without medical assistance beneath trees, outside of buildings, and underneath haphazard shelters. 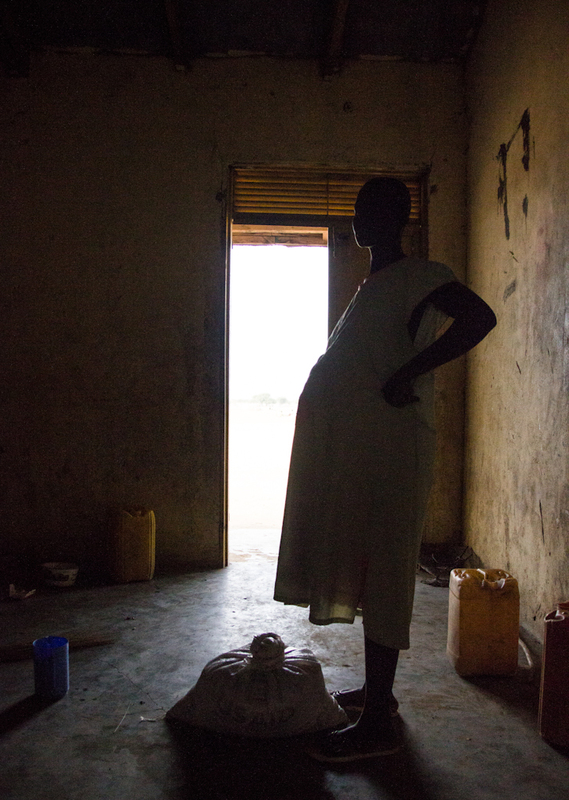 A silhouetted pregnant woman rests at an IDP site. Sick, taking care of a newborn, husband-less, without food, homeless – it’s no wonder so many people feel hopeless. Because of the recent crisis, funding for development projects has reduced. Life-saving disaster response efforts are vital, but without the ability to fund long-term projects, the country’s development comes to a halt. Hundreds of thousands of displaced families have fled northern South Sudan to Warrap State, where we work. With no choice but to build makeshift shelters on land that was once someone else’s farms, their presence is a cause for tension and puts a strain on local resources. The majority of the people we serve know at least one person who has been killed. Thus, a large portion of a family’s resources and time have been spent on hosting and traveling to burial services. Additionally, the South Sudanese pound continues to lose value against the American dollar, skyrocketing import costs and consequently making many resources unbearably expensive. Much of South Sudan’s younger generation was born into war, thus all they know is war. When asked, many say they would love to live in a world without war, yet most of them have no idea what that would look like. Because of this, instilling the notion of hope and the possibility of change can be a very complex process. We believe that we have been called to South Sudan for a reason. And we believe that reconciliation, peace, and healing are possible. We know that the One who created us all, can surely bring hope and peace to the seemingly hopeless circumstances in South Sudan. And despite the horrible things we, as humans, do, He is still holding out for us, waiting patiently and moving us toward a world renewed. So today, this morning, this evening, whenever you read this, though you may feel bombarded by a world of painful things, we ask that you remember South Sudan and pray for peace. And please continue to pray for South Sudan’s leaders – that they would lead with integrity. South Sudan was recently ranked the 5th most corrupt nation in the world. Also, pray for safety, healthy, and strength for our field staff – they are the hands and feet of world Concern. Please consider giving a gift to bring hope and life to the people of South Sudan. In the midst of pain, in the depths of suffering, under the tarps of IDP camps and tin roofs of refugee shelters, we know that there exists a surpassing peace and hope for a world transformed. You survived (or avoided) Black Friday and Cyber Monday and made it to Giving Tuesday! A much more meaningful day, we think. Giving Tuesday was created to encourage giving to charity during the holiday season, which we heartily support! Clean water is a life-saving gift. You can provide this for children like this boy in South Sudan, knowing your gift is changing lives. Here at World Concern, we have a special Giving Tuesday challenge – an opportunity for you to double the impact of your gift. Any gift made to the Global Gift Guide by the end of today will be matched. We’re already more than half way to our goal! After hearing about the success of this challenge, another donor has offered up an additional $10,000 in challenge money. An amazing blessing. Will you help us reach our goal and ensure the families we work with benefit from these matching funds? If you’ve been thinking about giving alternative gifts that truly impact the lives of the poor this year, today is the day to do it. You’ll double your impact, helping provide life-saving care and practical gifts to twice as many children and families living in extreme poverty. Clean Water – Help build a well! For families who are used to walking for miles to fetch dirty water, a well is a real blessing. Give a Goat! – Help hungry children with a kid goat. Once full-grown, goats can produce up to a gallon of nutritious milk each day. Soccer Balls – Soccer is more than fun and good exercise—it’s a sport that unifies and builds friendships. A soccer ball shows kids somebody cares. Thanks for helping us reach our Giving Tuesday matching challenge goal, and for giving gifts that really matter. Note: This article was originally published on the Huffington Post Impact X blog on Oct. 10, 2012. As NGOs shift our response from disaster to development, there are still many hungry people to feed. Getting food into the hands of the hungry in the Horn of Africa is about to go high tech. Seattle-based humanitarian organization World Concern is piloting a new mobile phone app in the drought-stricken region, aiming to streamline the process of tracking food distributed to hungry families and payment to local merchants. World Concern has been distributing food and emergency supplies to families affected by the Horn of Africa drought since July 2011. As famine spread throughout the region, aid organizations struggled to reach millions of people, especially those living in southern Somalia. World Concern distributed vouchers to hungry families who were able to purchase food from local merchants. The system supports the local economy and helps ensure food reaches those in greatest need. This method has been extremely effective, even in dangerous and hard-to-reach places. More than 30,000 vouchers have been distributed so far, each representing a two-week supply of rations for a family of six. World Concern staff members learn to use a new mobile app to track food distributions in the Horn of Africa. The new mobile app allows field staff to use a tool they are already carrying (a mobile phone) to record data in the field (instead of a pencil and paper), and negates the need for re-entry into a computer at a later date. This saves time and reduces the risk of errors. The system tracks beneficiaries and the food they receive via bar codes that are scanned into a mobile phone. Merchants have an I.D. card with a barcode, which is also scanned so they can be paid via wire transfer almost instantly. The mobile app was developed by Seattle start up ScanMyList, whose founder, Scott Dyer, created a mobile application to help retail businesses track inventory. When Dyer saw one of World Concern’s vouchers, he realized the same system could help the humanitarian organization reach people during a disaster more efficiently and track aid more accurately. Dyer traveled to the Horn of Africa with World Concern to kick off the pilot program, which will put the new technology into action in the field this month, as 4,000 food vouchers are distributed in Eastern Kenya and Southern Somalia. The real brain behind this technology is the custom database, which is not only programmed to receive data from mobile phones, but to “think” about what it receives. The database will identify possible duplicate entries, flag significant variations in data, and crosscheck entry errors. Then, the database is programmed to generate custom reports in real time. World Concern staff can view these on a website, seeing exactly how many meals are distributed immediately. World Concern and partner agency staff practice scanning bar codes with their mobile phones during a training last week. “This technology will enable our staff to report on their life-saving distribution in real-time, increasing our ability to respond to immediate needs as they arise,” said Chris Sheach, deputy director of disaster response for World Concern. While the “famine” has officially ended in the Horn, the long-term effects of such a severe drought and crisis will be experienced for many years to come. As NGOs shift our response from disaster to development—teaching pastoralists who lost their herds to farm and other forms of livelihood diversification—there are still many hungry people to feed. This new technology will enable us to do this even more quickly and efficiently. It can also be used in other types of disasters, particularly in cash-for-work programs. 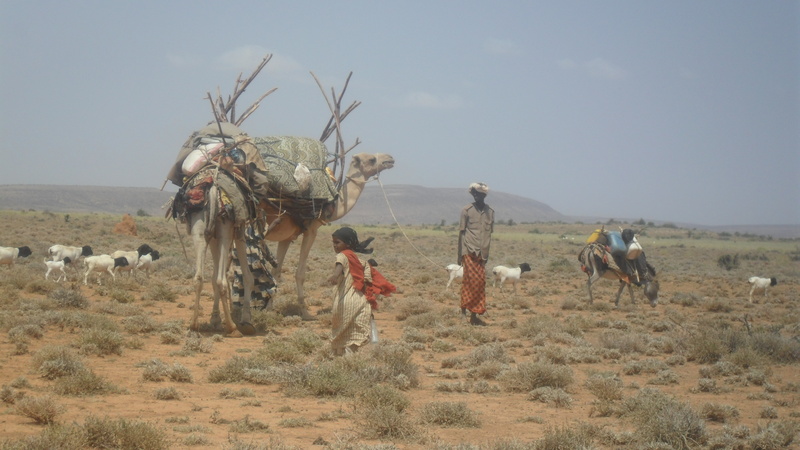 A nomadic family on the move in Somaliland. In Somaliland, I spent time with real nomads. Not only do they move with their herds of camels and goats from place to place in search of water, they often do this away from all other social contact for weeks, maybe months at a time. My wife and I may not see our family very often, but at least we have church, colleagues, and neighbors. True nomads just keep moving, but in Somaliland that is changing. Years of drought and desertification, coupled with conflict, are making the nomadic way of life much more risky. Rains are fewer and far between. I’ve visited places that get rain two or three days per year. Ironically, so much rain falls that day that it causes walls of water 15 feet high to roar down dry river beds, washing away whole families. Between the constant wind and these flash floods, soil is eroded away and the high central plains are mostly bare rock, with a few inedible shrubs. Driving across this expanse of desert, not passing a vehicle for days, it is easy to see the comfort of the nomadic life, as well as the struggle for existence. It’s very peaceful—just a few wild animals, the sky, vast stretches of land, quietly grazing herds. But the daily trek for water can be 30 or 40 miles, and there is no health care, no education, no places of worship. You live alone, and you will likely die alone. Why then does this way of life persist? Why is it so heartbreaking to see nomadic families lose everything, and be forced to live in villages, where they make less than 50 cents a day? It’s about home. Home is not your living quarters, whether a hotel room, a grand palace, or a bundle of sticks and a tarpaulin. Home is not who you’re with, but who you miss. Home is about a sense of purpose, a feeling of well-being, regardless of services and amenities that are available. Home truly is “where the heart is.” But what does this have to do with me and Somaliland? 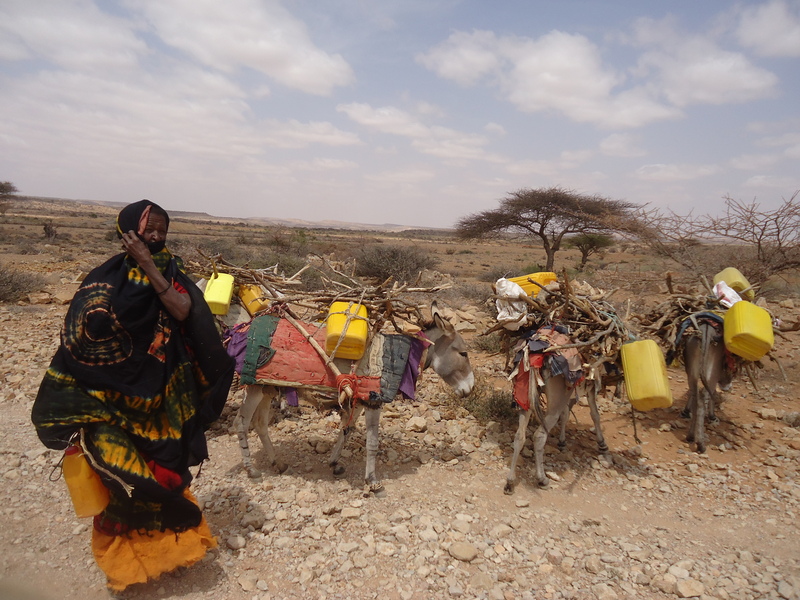 Donkeys carry firewood and jerry cans in Somaliland. In disaster recovery theory, we do not accept that we can enable a return to pre-event conditions. This is especially true in slow-onset disasters like droughts, where it is difficult to even set a time and place which is accepted as normal. Rather, there is a move towards building a new normal—a safer, more resilient, and more risk-adverse normal. In Somaliland, this means smaller herds, diverse income sources, and improved rangeland and water management. Technically sound, but for the old man who just wishes he could die the way he was born, on an open plain to the sound of camel bells and the blowing wind, it’s hooey. Recovery must be something you can believe in. In my mind, recovering from a disaster is about accepting a new sense of the word normal, and embracing a future that is quite different from the past. It’s about acknowledging the inevitable march of progress, and anticipating the opportunity for previously unknown joys. It’s about coming home to a new home. A World Concern staff member measures Baby Adey's tiny arm to determine her level of malnourishment. 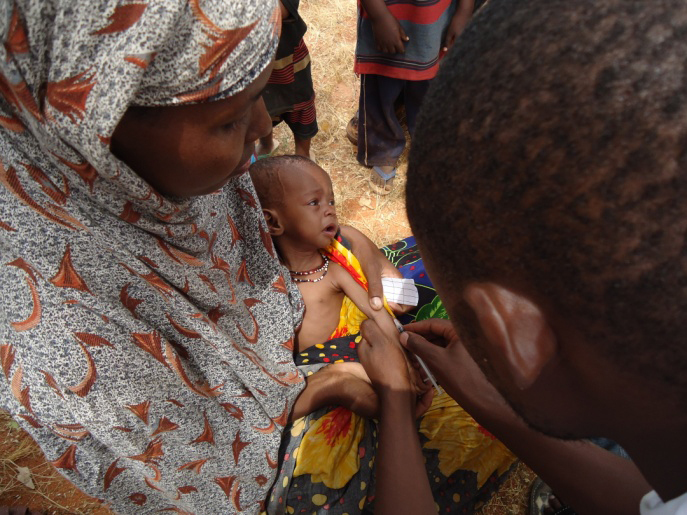 Baby Adey’s mother must have felt desperate as she lay sick and bedridden in her home in Garissa—an area of Northeastern Kenya badly affected by the Horn of Africa drought. But as a mother, her own illness was surely not as frightening as her child’s. Our health workers in Garissa—where one in three infants is underweight—discovered Adey and her mother during a visit to their home. They were too sick to travel, so we went to them. 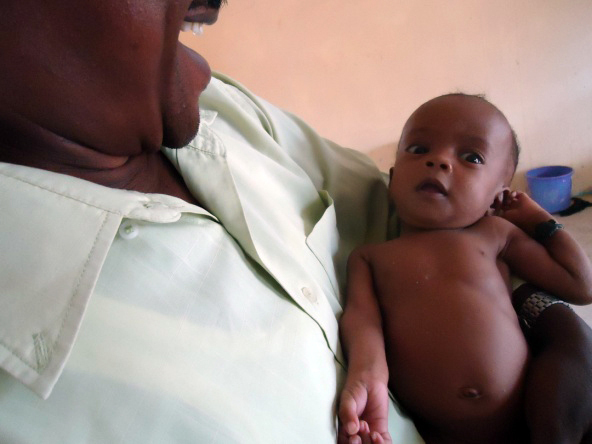 Adey’s father told us his wife hadn’t been able to breastfeed because she had no milk. Six-month-old Adey appeared tiny, weak and lethargic. The average 6-month-old baby girl in the U.S. weighs 16 lbs. Adey weighed just 4 lbs. 6 oz.—less than most newborns. She was malnourished, dehydrated and had an upper respiratory infection. World Concern staff transported Adey and her mother to the hospital, where the baby received antibiotics, fluids and emergency nutrition. Her mom, who was also malnourished, was treated for her illness and given nutritionally fortified porridge. Little Adey gained almost four pounds in three weeks after receiving medical care and emergency feeding at a local hospital. Three weeks later, a much happier, healthier baby Adey was discharged from the hospital weighing 8 lbs. 2 oz.—almost doubling her weight. Receiving Baby Adey’s story in my inbox reminded me that the crisis in the Horn of Africa is not over. When the U.N. declared parts of Somalia were no longer experiencing famine conditions (in which 30% of children are acutely malnourished and 2 adult or 4 child deaths per 10,000 occur each day), the food crisis disappeared from the headlines. But it’s not over. At the time of the UN declaration, there were still 9 million people in need of aid in the Horn of Africa. Baby Adey and her family were among them. Hope has been restored to this family. If you’d like to help us reach more families like Adey’s, please visit www.worldconcern.org/beyondfamine. World Concern is expanding its drought response in the Horn of Africa into several new communities near the Kenya-Somalia border, reaching a larger number of displaced, hungry families and refugees who often travel through or settle in these towns. We’re providing vouchers for emergency food, supplies and access to water through repaired wells, rehabilitated water pans and construction of rainwater catchment systems in these unreached communities. Despite the declaration by the United Nations on Feb. 3, 2012 that official famine conditions have ended in Somalia, the UN Office for the Coordination of Humanitarian Affairs says there are still 9.5 million people in need throughout the Horn of Africa. In Somalia, 2.3 million people are still suffering the effects of drought and ongoing conflict, and in Kenya, 4.3 million need assistance. 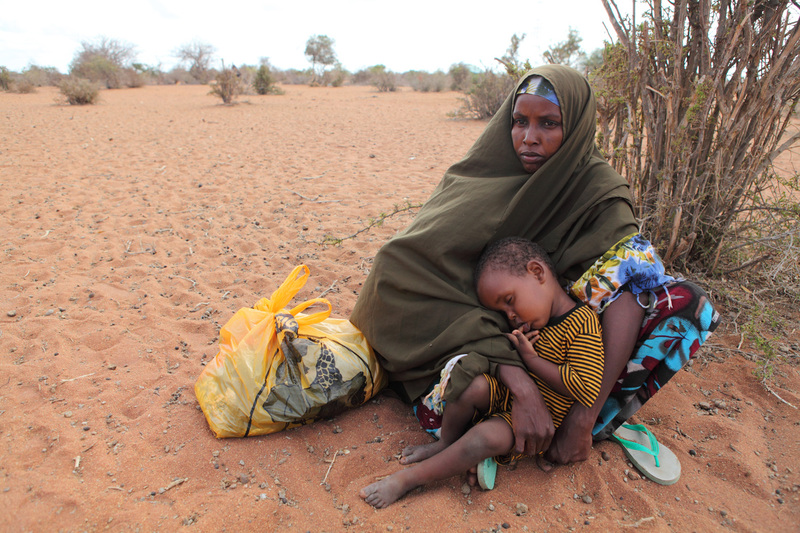 Habon Farah and her 9-month-old twins fled their hometown in southern Somalia because of drought and famine. 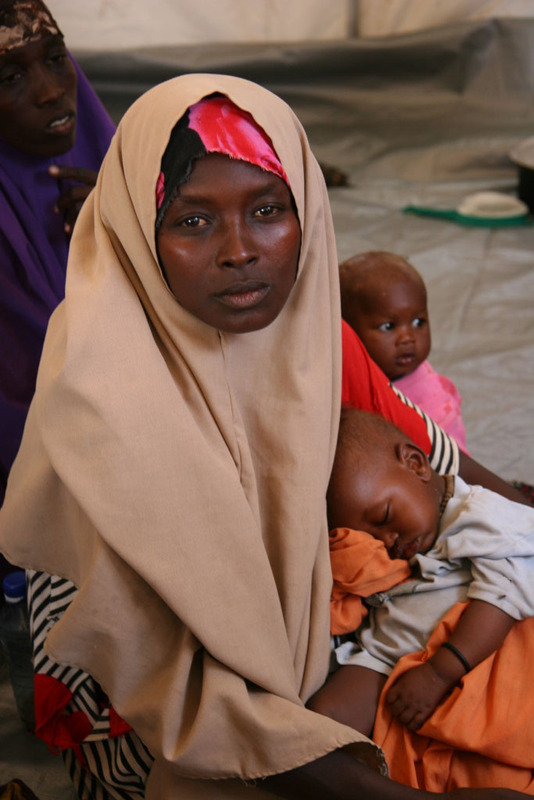 Among those we’ve helped is 23-year-old Habon Farah, a mother of 9-month-old twins who fled her hometown of Jilib, Somalia, and traveled on foot 155 miles to Dhobley. Habon says she left Jilib because her family was hungry. There had been no harvest for three years, according to officials in the area. Although she hopes for a better life for her children, right now, her biggest concern is survival. We met her in a crowded tent with about 30 other families and have assisted her with food, water and emergency supplies. With support from donors, we’re able to expand our response in the Horn of Africa and reach more families like Habon’s. This week we received a donation of $60. While that might not seem worthy of its own blog post, it is. Trust me. The check was sent by Kim Kargbo, the director of Women of Hope International, a fellow Christian nonprofit that helps women with disabilities in Sierra Leone improve their lives. I called Kim to learn why another humanitarian agency would send us a donation instead of putting it toward their own programs. The story she told me confirmed my belief that anyone, in any circumstances, can be changed by giving. A few months ago, Kim and her staff held a meeting with the women they serve. They do this each month to talk about issues related to their disabilities and ways to overcome them. These women live hard lives – most of them are beggars themselves, living on less than $1 a day. Women of Hope helps restore dignity and purpose to their lives through their programs. Having heard about the famine in Somalia, Kim went online to look for a video she could show the women. She came across World Concern’s Eyewitness to the Famine video and shared it with them. The women were moved by the video and Kim’s explanation of famine. Most of the women are illiterate and some didn’t know that Somalia even existed. But they knew about refugee camps from their own country’s experience with war. This time they nodded their heads, yes. Even if each of them pitched in just a few coins, surely it would help a little. Kim agreed and told them that Women of Hope would match whatever they raised. The women returned a month later for their Christmas party and had raised a bit of money, but not much. They wanted to do more. So they decided to take an offering that night. What happened next was amazing. A blind woman in Sierra Leone is led forward at the Women of Hope International Christmas party to offer a donation to the famine relief. About 50 women came forward to give. 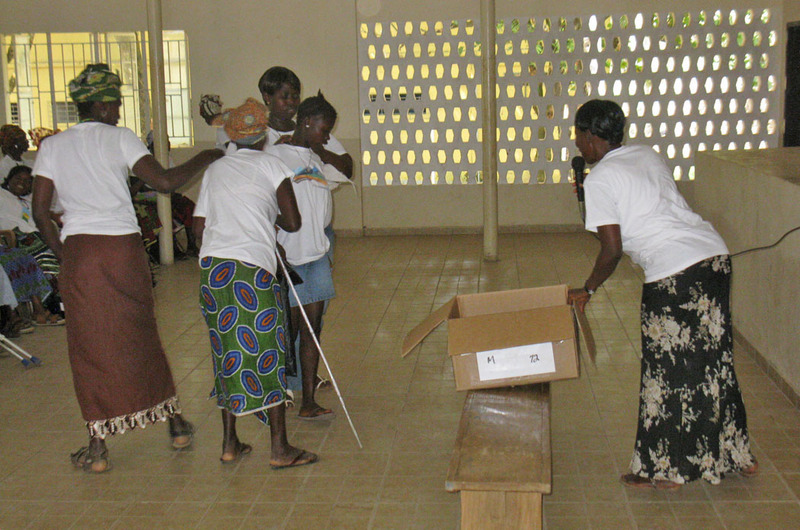 One by one, they lined up – blind women being led by the hands of children, and others in wheelchairs – to drop their few coins in a cardboard box. At the end of the night, they had $30. With their matching gift, they were able to send $60 to World Concern. “I know it’s not much,” Kim said when I spoke with her on the phone. “Oh, but it is,” I said. We’ve been asking donors to give $60 to provide emergency food rations, access to clean water, and long-term assistance to a family affected by the famine. Most of us love to sleep. We dread the alarm clock that interrupts our blissful 8-hour escape to dreamland. We look forward to weekends when we can catch up and sleep in a bit. As we get older, we appreciate bedtime more. 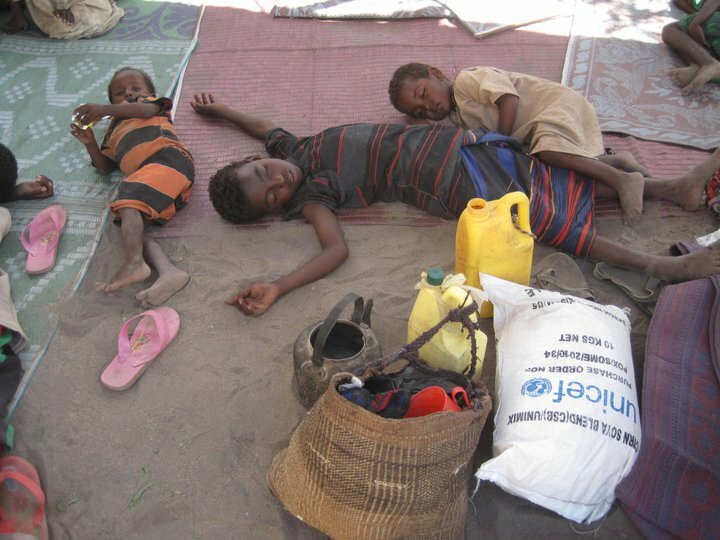 Children sleeping on the ground in Somalia. Good sleep protects our health, boosts our immune system, and helps our bodies and brains restore themselves. Most of us live in places where we can lock our doors at night and sleep in relative peace without fear of harm. It’s a blessing we often take for granted. I was reminded of this while touring an exhibit at Medical Teams International yesterday. Visitors are invited to step inside tents and shelters that serve as homes for people in places like Haiti and Uganda. Imagining the discomfort of sleeping on the ground with six people in a tent was troubling, but what disturbed me the most was thinking about the insecurity these families must feel when darkness falls. They have no doors to lock, and a plastic tarp offers no protection from potential intruders. A little boy sleeps on his mother's lap as she rests on the long walk from Somalia to refugee camps in Kenya. Those who have survived a sudden disaster, like the earthquake in Haiti, often sleep lightly with one eye on the door and are jolted awake by the slightest sensation of shaking. Others living in crowded tent cities for months fear the danger of intruders. Families who have received new homes from World Concern are grateful to have doors and windows, they tell us. 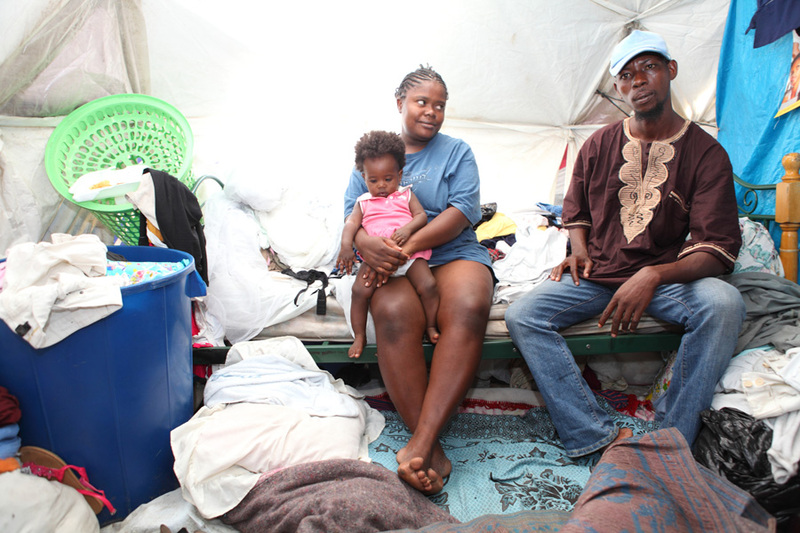 A family who lost their home in the Haiti earthquake sits on the bed inside their tent. Being able to sleep is one of blessings of having a home. Tonight, when you crawl into bed, take a moment to thank God for the gift of a good night’s sleep and say a prayer for those who don’t have this.